In Hair Transplant, hair is transferred from the rear part of the scalp to the sparsely covered area. It is carried out under local anaesthesia. The whole procedure is comfortable and carried out with utter care to ensure patient’s satisfaction. The transplanted hair continues to grow in its new area naturally and as usual throughout the patient’s life-time. Since the transplant procedure is carried out under local anaesthesia, any risk is virtually nil. A good hair transplant is unnoticeable. If a person does not have enough hair over the back side of his head, we can take hair from parts of the body (chest, beard etc.) as well. A successful hair transplant in Delhi is followed with a thorough diagnosis by a specialized hair doctor who can give the prognosis regarding the Alopecia and its possible continuation. Dr. Gaurav Garg, Principal Dermatologist at Dermalife is one of renowned hair transplant surgeon and dermatologist in Delhi. He has the capability to provide his patients with promising results that look all natural. Hair Transplant in Delhi is done by various techniques. At Dermalife, it is performed by one of the finest hair doctors in Delhi, Dr. Gaurav Garg. We at our clinic, carry out only the latest techniques with sophisticated instruments. Dr. Gaurav Garg a renowned surgeon for best hair transplant in Delhi is available at Dermalife. He along with his team of experts is dedicated to offering premium professional quality of service and has a huge base of satisfied clients to his credit. There are two main procedures for best hair transplant in Delhi currently in use but it is important to choose the right technique depending on the type of baldness and hair type. The major difference lies in the way hair follicles are plucked out from the donor area. 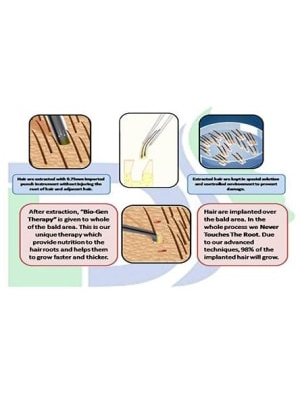 At Dermalife, we perform the Follicular Unit Extraction or the FUE technique. This is a unique procedure and it works best for all types of baldness. In this technique, the individual hair follicle is taken from the scalp randomly and then planted on the balding area. During the transplant, Dr. Garg uses the Bio-Gen Therapy and other such latest techniques which helps promote tissue healing and new cellular growth. There are a lot of procedures for hair transplantation and it is important to choose the right procedure depending on the type of baldness and hair type. Our procedure of doing hair transplant is very unique and works best for all types of baldness. and high sterilization of the OTs. It is a highly specialized technique in which we never touch the root of the hair during the whole procedure including extraction and implantation. The result of which is high density hair growth over the bald area. This technique has produced exceptional results and Dermalife is one centre in Delhi that has excelled in providing a success rate with additional modifications. What happens after Hair Transplantation? During the hair transplant, we do Bio-Gen Therapy for hair nourishment which ensures good growth of not only transplanted hair but also the existing hair. The result of the combination of Boosted-FUE with Bio-Gen Therapy is so good that no one can notice that you have undergone some procedure against your baldness. Also, the technique used by Dr. Gaurav Garg at Dermalife Skin and Hair Clinic in Delhi reduces the time gap between the hair transplant and the appearance of the full grown hair by 5 to 6 months.